At Scrubby Dutch, we value your feedback. Please click here to leave us a review! For more than 30 years Scrubby Dutch Cleaning has been the preferred cleaning service provider of St. Louis residences. Our attention to detail and consistent service sets us apart from our competition. We are committed to not only providing a quality cleaning service, but making our clients happy and satisfied. “I couldn’t be an happier to write a review. We had NEVER had the pleasure to have someone come and clean our home. Once I finally decided to call in some cleaning help…. after having our home’s vents cleaned professionally. I was amazed by what a wonderful job Dawn and Britney did on our home. They put the extra time and effort into making sure everything was as clean as humanly possible! Not to mention the ladies were so friendly and it really was as reasonable as I could get price wise. I will forever be a big fan of Scrubby Dutch Cleaning. 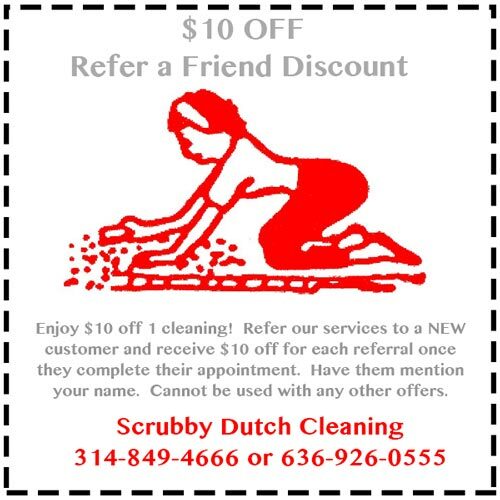 Actually decided to use them twice a month!” – Cora K.
“Called Scrubby Dutch at last minute for cleaning before a get together this weekend, got prompt service. Did very good job cleaning, leaving my home dust free and smelling wonderful! I will definitely use them again!” – Kimber C.
“The girls were very friendly, and they worked real hard. A good experience and will definitely use them again.” – Ben N.